Large Shamrock Shape Address Plaque - - personalized with a family name, address number, and street and the color you select. Custom made in the USA. Silhouette wall sign manufactured in the shape of a three-leaf shamrock. Holds three lines of personalization. Line one holds up to fourteen (14) 2-1/2" characters. The identification number on the lower part of the picture is for internal use only and is not on your shamrock. Comes with mounting holes and stainless steel mounting screws. Dimensions are approximately 18-1/2" wide x 20" high x 1/8" thick. 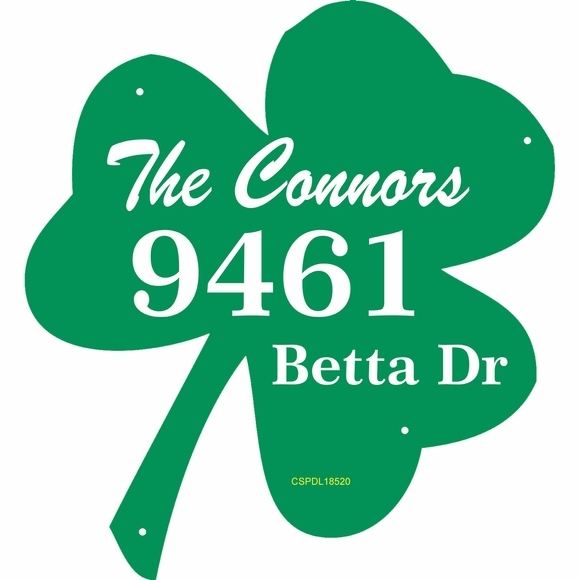 18.5" x 20" Irish theme address sign in the shape of a shamrock. Custom made in the USA.